March 21, 2016 – NASA’s James Webb Space Telescope just got a little closer to launch with the completion of cryogenic testing on its science cameras and spectrographs and the installation of the final flight mirrors. After over a year of planning, nearly four months of final cryo (cold) testing and monitoring, the testing on the science instruments module of the observatory was completed. They were removed from a giant thermal vacuum chamber at NASA’s Goddard Space Flight Center in Greenbelt, Maryland called the Space Environment Simulator, or SES, that duplicates the vacuum and extreme temperatures of space. The SES is a 40-foot-tall, 27-foot-diameter cylindrical chamber that eliminates almost all of the air with vacuum pumps and uses liquid nitrogen and even colder gaseous helium to drop the temperature. “This is the culmination of a lot of hard work by a lot of people who have been working for many, many years,” said Jamie Dunn, NASA’s Integrated Science Instrument Module Manager for the Webb telescope at Goddard. “This final test was phenomenal, everything is working spectacularly well. The science instrument modules tested consist of the mid-infrared instrument (MIRI), jointly developed by a nationally funded European Consortium under the auspices of the European Space Agency (ESA) and the Jet Propulsion Laboratory; a near infrared spectrometer (NIRSpec), jointly developed by Airbus for ESA and the U.S.; the Fine Guidance Sensor/ Near-InfraRed Imager and Slitless Spectrograph, provided by the the Canadian Space Agency and developed by COM DEV International, Cambridge, Ontario, Canada; and Near Infrared Camera (NIRCam), built by a team at the University of Arizona and Lockheed Martin’s Advanced Technology Center. 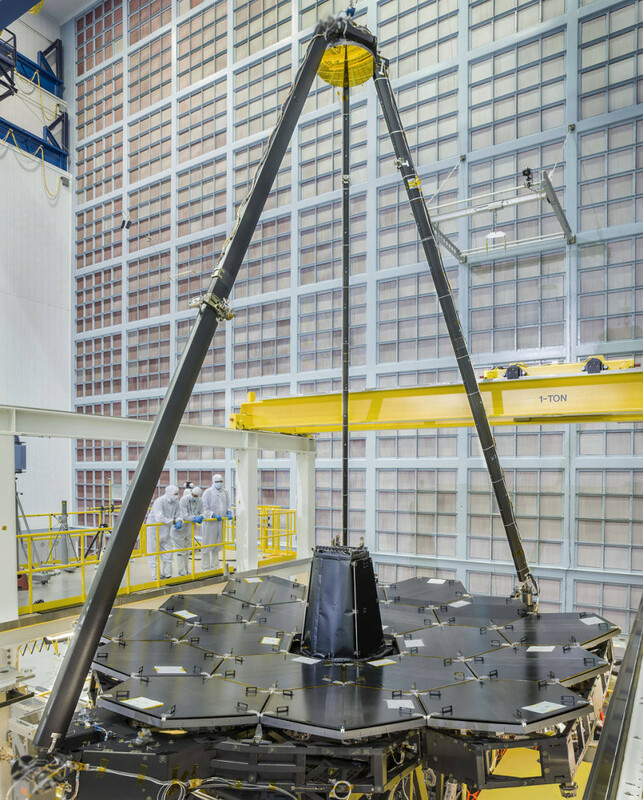 The Webb telescope’s primary mirror segments and secondary mirror are made of beryllium, which was selected for its stiffness, light weight and stability at cryogenic temperatures. Bare beryllium is not very reflective of near-infrared light, so each mirror is coated with about 0.12 ounces of gold to enable it to efficiently reflect infrared light (which is what the Webb telescope’s cameras see). After incoming light hits the expansive primary mirror, it is directed onto the small circular secondary mirror, which reflects it back in the direction of the primary mirror and into the AOS. Inside the back end of the AOS is the tertiary mirror, where light bounces forward to the fine steering mirror at the ‘front’ of the AOS, which then reflects it out the back of the AOS to a focus behind the primary mirror for the scientific instruments. “The completion of these major milestones represent huge achievements for NASA and our industry, European, Canadian, and academic partners. ISIM and the telescope only reached these milestones because of the passion, dedication, and imagination of an outstanding group of individuals. The next major step is assembling the instrument module and the telescope together to complete the entire ‘cold’ section of the Webb observatory,” said Bill Ochs, Webb telescope Project Manager at Goddard.